Bodrum is Turkey’s Turquoise Coast at its most vibrant. This is a holiday destination du jour with a marina full of bobbing yachts ready to whisk you out onto the Mediterranean, a handful of ancient sites for sightseeing and a town filled with photogenic old whitewashed houses. Once the ancient city of Halicarnassus, by the late Ottoman era Bodrum had turned into a simple fishing village. But all that changed in the 1940s when tourists entered the fold. Now during summer this town buzzes with energy as visitors come from all over the world to soak up Bodrum’s charm and appreciate its attractions. If you happen to visit out of season though, you can still catch a hint of the old village atmosphere. 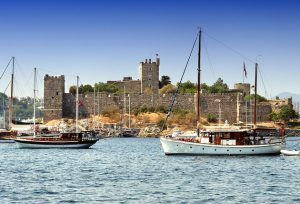 Lording over the seafront, the Castle of St Peter is at the top of every visitor’s things to do in Bodrum list. The Knights Hospitallers of St John built the structure between 1402 and 1437, and knights of various nationalities were entrusted with the defense of particular sections of the walls. Among the various towers are the French Tower, English Tower with a sculpted lion on its west wall, and the Gatineau Tower, which leads to the dungeons. During the reign of the Ottoman sultan Süleyman the Magnificent, the castle passed into Turkish hands and a mosque was built inside. Today many of the vast halls inside the castle display the exhibits of Bodrum’s Museum of Underwater Archaeology. This absolutely brilliant museum inside the Castle of St Peter is a must-see even if you don’t have an interest in underwater archaeology. The layout of the exhibits is clearly organised and dazzling artifacts are complimented by slick multimedia displays. After the entrance, with its huge amphorae collection and a glass-blowing workshop that kids will find fascinating, you enter the Glass Wreck Hall to the display of a 16 m ship that sunk in 1025 AD. The French Tower is home to another dazzling underwater find – the cargo of a classical Greek ship that sunk in the 4th century BC. 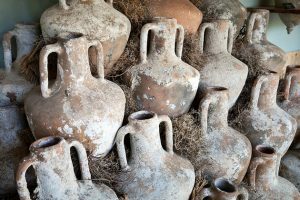 In the Uluburun Wreck Hall and adjacent Treasure room is the museum’s crowning glory: excavated finds recovered from several Bronze Age shipwrecks. It doesn’t look like much these days (you may need to put your imagination hat on), but this pile of ancient marble and rubble was once one of the seven wonders of the ancient world. 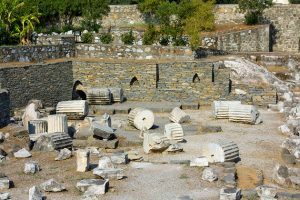 Architect Pytheos designed the Mausoleum of Mausolus as the final resting place of King Mausolus (376-353 BC) in Halicarnassus, Bodrum’s ancient name. When finished, the impressive towering structure measured 46 m high and was decorated with magnificent friezes by the most celebrated Greek sculptors of the day. 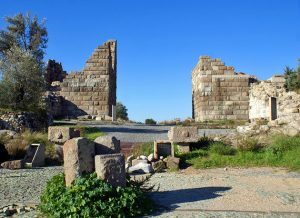 Despite damage by earthquakes over the centuries, the mausoleum resisted the wear of the ages until the Knights Hospitallers used its stones to build the Castle of St Peter. The modern day site, in a peaceful garden setting, is worthy of a look if just to say you’ve seen one of the seven ancient wonders. There’s also a helpful scale model of the original mausoleum on site. One for the supreme history-fiends, this gate from King Mausolus’ era is the last remaining section of once sturdy fortress walls. Measuring for 7 km, the walls wrapped around and protected the ancient city of Halicarnassus. 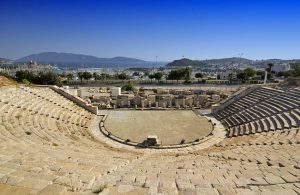 Bodrum’s ancient theatre may be small but it’s been beautifully restored. Views from the upper tiers, out towards the mountains, are superb. And in its heyday, the amphitheatre held 13,000 spectators. It’s the crystal blue Mediterranean that calls most visitors to Bodrum, and yachting is big business here. 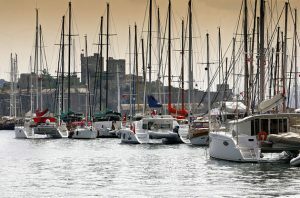 The marina is a sailor and sea-lover’s paradise, crammed with bobbing yachts of all shapes and sizes. There are dozens of options to get out onto the water with excursion vessels offering day trips (or longer) to visit islands and hidden coves for sunbathing and swimming. If you follow the marina road further west, you’ll come to the Ottoman shipyard, which has some interesting tombstones and great marina views. 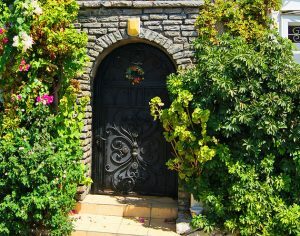 Just behind the Castle of St Peter is Bodrum’s most interesting area. The narrow pedestrian alleyways are lined with vine-covered, whitewashed and stone-cut cottages that look like they belong on a postcard. There are plenty of cute boutiques and cafés in this area if you need to sit down and relax after strolling. 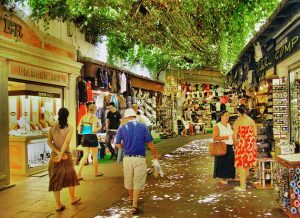 If you’re looking for some retail therapy, Bodrum has it all. The modern bazaar area is an upmarket take on an original Turkish market with proper shops rather than stalls. There is less room for bargaining, but what it loses in authenticity it makes up for in choice. There’s everything here from gorgeous Turkish and Central Asian textiles and colourful local pottery to a bling-fest of gold jewellery and snazzy beachwear. Enjoying a lazy afternoon meandering between the shops after a morning of sunbathing is what Bodrum is all about.